HUNDREDS of millions of pounds has been lost to the public purse through fraud and staff errors, an investigation by the Audit Office reveals today. The report, by Auditor General Kieran Donnelly, further reveals how a third of government departments and their so-called arms length bodies (ALBs) have been reprimanded for spending millions of taxpayers’ money without proper authorisation. While the auditor’s latest report, due to be published today, will state that the majority of government departments have improved practices, his report will also show that six departments and their ALBs flouted their own rules to spend millions without proper authorisation. And the report shows that hundreds of millions of pounds of taxpayers’ money has been lost due to fraud and staff error. •	DSD: £66m lost due to fraud and staff error while DSD itself went £10m over budget. •	OFMDFM: Stormont’s most senior government department had “inadequate controls” over £7.5m to victims’ groups and is criticised for unauthorised consultancy payments and Maze/Long Kesh overspend. •	DARD: Agriculture department left with £19.4m gap in its budget due to EU fines. •	DCAL: Spent £3.48m without approval and went £2.74m over budget. Legal deeds for dozens of properties cannot be found. •	Education: Schools gave £660,000 in honoraria payments to staff without any authority from education chiefs. •	DARD: £4.7m in “irregular expenditure” at NI Water. Follows similar £21m irregular NI Water payments since 2008. •	Social Security Agency: £47.5m lost in fraud and staff errors. Claimants underpaid £13.7m benefits. •	Housing Executive: `significant weaknesses’ in control of £48.9m paid in maintenance contracts. Auditor expresses concerns over housing associations and potential police investigations into sale of executive land. •	General Consumer Council: Overpaid staff by more than £100,000 but continues with policy. •	Belfast Metropolitan College: Paid out nearly £600,000 to consultants without approval. Concerns raised over re-employment of staff shortly after being made redundant. The Auditor General’s report shows that tens of millions of pounds of taxpayers’ money is still being lost every year due to incompetence and the departments decision to ignore statutory guidelines. 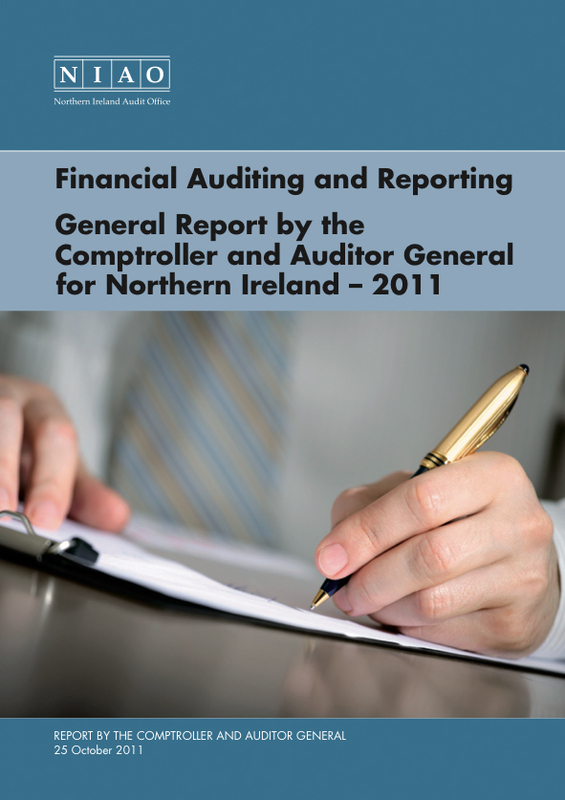 The report states the auditor’s decision to qualify – ie, refuse to fully sign off – or censure departmental accounts was indicative of weakness of financial control. DSD lost more than £66m in 2010/11 due to fraud/staff error. It went a further £10m over budget. But the most serious concerns raised by the auditor was over its control, through the Housing Executive, of housing associations. An internal DSD report highlighted “significant issues” in relation to one association, Helm Housing. Mr Donnelly said the issues raised were “potentially so serious” that he could not stand over £12.1m which had been given to Helm last year. However Helm was not the only housing association to be criticised. DSD paid out £165m to seven housing associations during 2010/2011. However, auditors found that “poor and unacceptable” management and governance practices led to four of the seven associations being censured. At least three investigations, some involving the police, are currently ongoing in relation to the sale of Housing Executive land and property to developers. Stormont’s most senior department has been forced to introduce a range of “corrective measures” after it was found to have had “inadequate controls” over £7.5m it paid out to victims groups. It was also revealed that OFMDFM had failed to secure the proper authority from the Department for Finance (DFP) for consultancy expenditure over £75,000. In one instance OFMDFM paid £143,000 to management consultants without prior approval from DFP. The audit report reveals that OFMFDM now has to seek DFP’s prior approval for any consultancy contract worth more than £10,000. The agriculture department was left with a major gap in its 2010/2011 budget after it had to pay back £19.4m in EU fines. Mr Donnelly concluded that the shortfall represents a loss to public funds which falls outside the assembly’s intentions in relation to the proper administration of EU funding. The sports and culture department went £2.79m over budget in 2010/11 and was criticised for spending £3.4m without proper DFP authorisation. The overspend related to its failure to include the building of a new Public Records Office in its rates bill. However DCAL also admits that it can’t establish legal ownership for land and buildings worth £2.9m. Another 50 assets have been identified, which may belong the DCAL, but are not included on its books. It is also unable to show ownership of sporting and fishing rights valued at £456,000. The report reveals that schools paid £662,127 in honoraria payments to staff, teaching and non teaching, without departmental approval during 2010/11. From September 2011 all such payments and the reason for payments must now be signed-off by the school principal, the chair of the board of governors and the education board. The report also highlights £116,000 in unapproved payments to staff at the Council for the Curriculum, Examinations and Assessment (CCEA) between 2008 and 2010. BMC, which is funded by the Department for Employment and Learning, has in recent years decided to relocate some of its campus to the Titanic Quarter. However the audit report raises concerns that BMC paid £585,000 to consultants to find new premises in the Titanic Quarter without having obtained any prior approval from DFP. Major concerns were also expressed over the college’s decision to make 56 staff redundant with full severance payments in 2008 only to then re-employ 19 in part-time roles a short time later. In one case BMC made a senior staff member redundant but then re-employed him one week later as a consultant. Auditors expressed surprise that BMC had paid the individual’s national insurance contributions and holiday pay, despite the fact that he had been hired as a self-employed consultant. BMC had employed him on a six month consultancy contract valued at £75,200. However this was subsequently extended on a pro-rata basis until November 2009. Auditors found that BMC would have saved more than £30,000 if he had been kept on as a full-time staff member. This takes into account the fact that the college paid national insurance contributions for him as an employee when no such payment was required during his period of consultancy. It also noted that as a consultant, the interim director appeared to have received paid leave, and would therefore appear to have been treated as a de facto employee. BMC defended the decision claiming it was needed to maintain stability at a critical time of the college. “In my opinion both the college and the department should have given more consideration to whether this arrangement provided value for money. “I also note that when the interim director was first appointed on a consultancy basis this was a seen as a short term measure by the department. Auditors found that the GCC has paid out more than £100,000 to staff in unapproved payments since 2004. Despite warnings, the practice still continues and there are concerns that the money may never be recovered. “As these salary overpayment are unapproved but are still being made to the staff of the council, it is important that the situation is fully addressed as soon as possible." The LPS is tasked with assessing and collecting Northern Ireland’s domestic and non-domestic rates. However since its inception in 2005 LPS has not only failed to meet its targets, but has been found to have made major miscalculations. During the last financial year rent arrears in Northern Ireland rose by £124m to £138m. However concerns have been expressed over the accuracy of LPS’s property listings. In March 2011 LPS had 24,501 domestic properties still to evaluate. There were equally serious delays in evaluating commercial properties. Auditors found that two retail units had queried LPS evaluations in mid-2003 but the issue had not been until 2009. One supermarket successfully challenged a 2003 evaluation which resulted in LPS paying back £800,000 for a seven year miscalculation. An LPS review led to a £24.5m shortfall in uninspected properties being uncovered. However auditors found that two years later more than 40% of the properties have still not been followed up. Although LPS has a computer system for identifying vacant properties, it has never been used. The auditor said that a lack of “completeness, existence and accuracy” of LPS accounts means that he could not be satisfied with the agency’s decision to treat property valued at £67m, as not being liable for rates. Since 2008 the outstanding rate debt has jumped more than £23m to £157m in 2011. However Mr Donnelly expressed disbelief that two government departments are among the worst debtors. NI Water and the Belfast Education and Library Board and two unidentified private sectors bodies currently owe £1.5m in rates. The departments defended their bad debt status, on the grounds that they are currently appealing the decision. However Mr Donnelly said their position was unacceptable. In 2010 more than £10.2m was written-off in unrecoverable rates; however that figure is expected to double in 2011. While LPS has the power to seek a court order preventing bad debtors from selling-off properties auditors found this has only happened in six cases.